You can download a copy of my research statement or a detailed CV. We explore the boundaries of human social abilities by studying human-robot interaction. Social robots operate at the boundary of cognitive categories; they are animate but are not alive, are responsive but are not creative or flexible in their responses, and respond to social cues but cannot maintain a deep social dialog. By systematically varying the behavior of the robot, we can chart the range of human social responses. Furthermore, because the behavior of the machine can be precisely controlled, a robot offers a reliable and repeatable stimulus. We model the development of social skills using a robot as an embodied, empirical testbed. Social robots offer a modeling platform that not only can be repeatedly validated and varied but also can include social interactions as part of the modeled environment. By implementing a cognitive theory on a robot, we ensure that the model is grounded in real-world perceptions, accounts for the effects of embodiment, and is appropriately integrated with other perceptual, motor, and cognitive skills. We enhance the diagnosis and therapy of social deficits using socially assistive technology. In our collaborations with the Yale Child Study Center, we have found that robots that sense and respond to social cues provide a quantitative, objective measurement of exactly those social abilities which are deficient in individuals with autism. Furthermore, children with autism show a profound and particular attachment to robots, an effect that we have leveraged in therapy sessions. To pursue this research, considerable challenges in building interactive robots must be surmounted. These challenges are at the leading edge of a fundamental shift that is occurring in robotics research. Societal needs and economic opportunities are pushing robots out of controlled settings and into our homes, schools, and hospitals. As robots become increasingly integrated into these settings, there is a critical need to engage untrained, naïve users in ways that are comfortable and natural. My research provides a structured approach to constructing robotic systems that elicit, exploit, and respond to the natural behavior of untrained users. Effects of Embodiment: My research characterizes the unique ways that people respond to robots. We focus in particular on how interactions with real robots differ from interactions with virtual agents. One of our results demonstrated that adults are more likely to follow unusual instructions (such as throwing textbooks into the trash) when presented by a physically present robot than when presented by the same robot on a television monitor. We have also studied how children's interactions with social robots elicit explanations on agency and the qualities required for life. 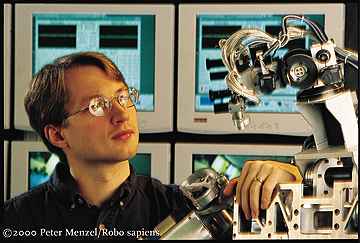 Pictured at right is one of the robots that we use in these studies, an upper-torso humanoid robot named Nico. Nico was designed to match the body structure of the average 1-year-old male child. This platform serves as both an interaction stimulus and as a testbed platform for our models of social development. Prosody Recognition: If speech recognition focuses on what you say, then prosody recognition focuses on how you say it. Prosody is the rhythm, stress, and intonation of speech and it provides an essential feedback signal during social learning. Our research produced the first automatic system for recognition of affect from prosody in male-produced speech, the first demonstration that prosody can be used as feedback to guide machine learning systems, and investigated the relation between prosody and the introduction of new information in human-human conversations. Intention from Motion: Humans naturally attribute roles and intentions to perceived agents, even when presented with extremely simple cues. A human will watch three animated boxes move around on a white background (as shown at right), and describe a scene involving tender lovers, brutal bullies, tense confrontations and hair-raising escapes. We have constructed systems that classify role and intent from the spatio-temporal trajectories of people and objects, including systems that recognize who is "IT" during a game of tag with performance that matches human judgments. 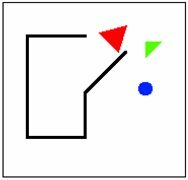 Our future work here focuses on how to link these low-level perceptual phenomena with higher-level models of belief and goal-oriented behavior. Joint reference: We implemented a skill progression similar to that observed in children in which the robot learns through unstructured interactions with an untrained adult to first reach out and touch objects, then to point to objects, and finally to follow the adult's direction of gaze to identify objects of mutual interest (a behavior known as gaze following or joint reference). This developmental progression acquires higher accuracy than any other published system for joint reference and requires 100 times fewer training examples. Furthermore, this model provides a justification based on problem complexity that favors active exploration and rich social engagement in human infants. Pictured at right is the robot Nico (without its clothing) engaged in one of these training sessions. The robot has selected an object on the table, and the human observer has focused on that same object without further communication. Self-other discrimination: One early developing skill that children must acquire is the ability to discriminate their own body from the bodies of others. We pioneered a kinesthetic-visual matching model for this task. By learning the relationship between its own motor activity and perceived motion, Nico learned to discriminate its own arm from the movements of others and from the movement of inanimate objects. Furthermore, this model works under conditions when an appearance-based metric would certainly fail. 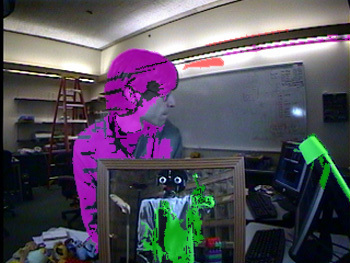 Shown at right is an image from the robot's camera with a red overlay on things it judges to be animate (but not itself) and a green overlay on moving things that it considers to be part of itself. Notice that when presented with a mirror, the robot judges both its own arm and its mirror image to be part of itself. This result is unique among computational systems and calls into question some of the common ethological tests of self-awareness that utilize mirror recognition. Language acquisition: Most research on computational language acquisition focuses either on a formal semantic model that lacks real-world grounding or on grounded perceptual systems that acquire concrete nouns. We developed a method for learning word meanings from real-world context that both leverages formal semantic models and allows for a wide range of syntactic types (pronouns, adjectives, adverbs, and nouns) to be learned. 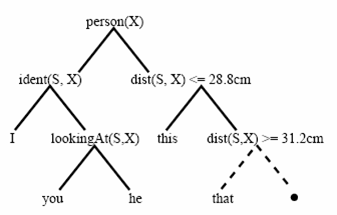 We have constructed a system that uses sentence context and its perceived environment to understand which object a new word refers to, and that over time builds “definition trees” (shown at right) that allow both recognition and production of appropriate sentences. For example, in one experiment, Nico correctly learned the meanings for the words “I” and “you,” learned that “this” and “that” refer to objects of varying proximity, and that “above” and “below” refer to height differences between objects. This model provides a formal computational method that explains both children's abilities to learn complex word types concurrently with concrete nouns and explains observed data on pronoun reversal. Quantitative metrics for autism diagnosis: We have evaluated systems for prosody recognition, gaze identification in unstructured settings, and motion estimation as quantitative measurements for autism diagnosis. All of these techniques address social cues that are deficient in many individuals with autism, have previously been suggested as fundamental to diagnostic procedure, and have been previously implemented on our robots. Our most promising approach has been gaze tracking and parameter estimation models of visual attention which has shown preliminary indications for being an early screening tool for autism. We have shown a pervasive pattern of inattention in autism differentiating 4 year old, but not 2 year old, children with autism from typical children, and provided a model for how atypical experience and intrinsic biases might affect development. This work demonstrated a number of deficits with traditional gaze analysis techniques and provided novel mechanisms for interpreting gaze data. Robots as therapeutic devices: As we have observed in our own clinic and as has been reported by numerous groups worldwide, many children with autism show increased motivation, maintain prolonged interest, and even display novel appropriate social behaviors when interacting with social robots. Our hope is to exploit this motivation and interest to construct systems that provide social skills training to supplement the activities therapists and families already engage in. 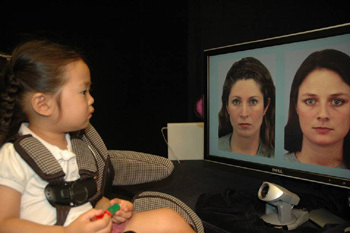 For example, in one pilot study, we demonstrated that children engaged in prosodic training showed the same levels of improvement when using a robot which provided feedback during part of their therapy time as when a trained therapist provided the feedback directly throughout the allotted time. Our therapy work focuses on identifying the properties of robotic systems that provoke this unique response and on establishing skill transfer from human-robot pairings to human-human pairs. 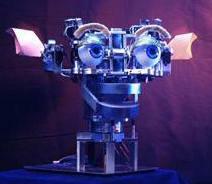 Cog: Before arriving at Yale, my research focused on the construction of a humanoid robot named Cog under the direction of Rod Brooks. My dissertation work focused on building foundations of a theory of mind for Cog. This included building systems that represent a "naive physics" that distinguish animate from inanimate stimuli, an "intuitive psychology" that attributes intent and goals, and systems that engage in joint reference such as making eye contact. These systems are based on models of social skill development in children and models of autism. 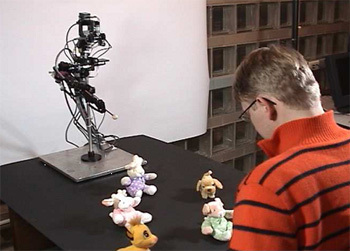 This robot was capable of simple imitation of unstructured human arm movements, and was one of the first attempts to construct behaviors using a developmental framework inspired by the developmental progression of skills observed in human infants. Kismet: Kismet was an exploration of the recognition and generation of social cues. This robot was capable of generating a variety of social gestures and facial expressions in response to the perceived social response of a person. With Cynthia Breazeal, I constructed systems to exploit social interactions with people in order to explore just how much a robot can learn when placed in a supportive learning environment. 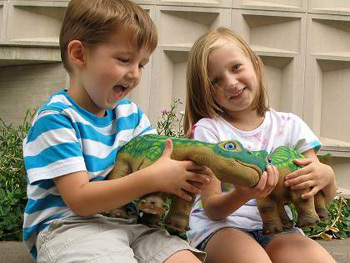 Kismet was one of the first robots to excite my interest in using robots as a tool for studying human social behavior; our work in studying how children reacted to this device demonstrated that a robot could often elicit detailed explanations from children on what makes something alive.